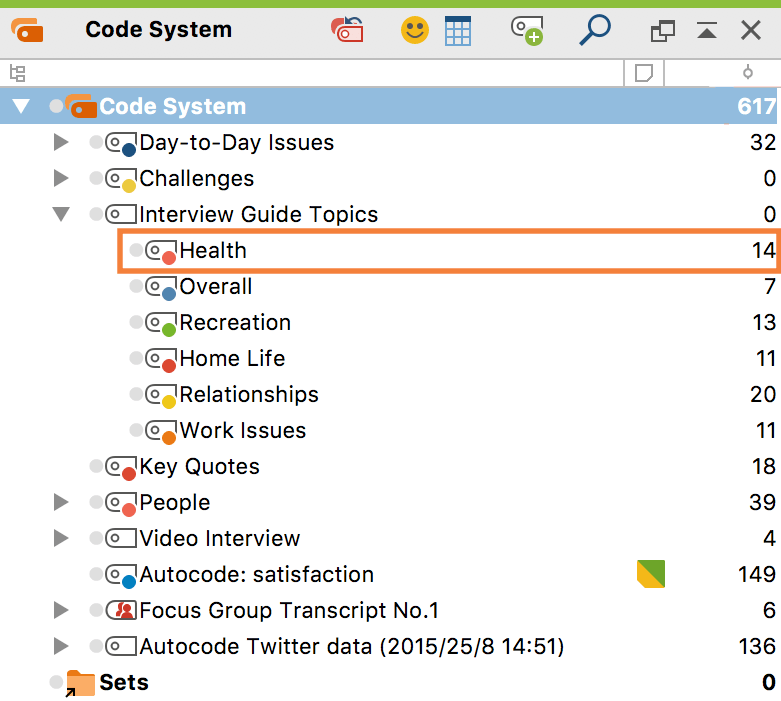 Information on if and how many coded segments are assigned to a specific code can be found in the “Code System”. This information is displayed in the frequency column to the right of the code name. In the following figure, the number 14 appears after the code “Health”. This indicates that up until this point, a total of 14 segments have been coded in this category. When you “collapse” a subcode into a code by clicking the arrow symbol in front of the code, the frequency of the subcode will be added to the frequency of the top-level code. Therefore, for a collapsed code, MAXQDA displays the number of segments that were coded with this code including all of its subcodes. To change this setting so that only the frequency of highest-level codes is displayed, click on the gear symbol in the top right of your window, which opens your MAXQDA Preferences and deselect Sum up subcodes in “Code System” window. By default, the numbers in the “Code System” indicate how many segments have been coded with each code. You can change this at any time to display the number of documents the code occurs in. Right-click on the top-level entry in “Code System” labeled under the same name and select Display number of documents. Or simply click on the column header of the code frequencies. You can switch the display back in the same way, except that you select Display number of coded segments in the context menu. If you collapse a code while the number of documents is displayed, MAXQDA displays in how many documents the code or one of its subcodes occurs.